Why don't our children return our love? What are we not understanding? What are we failing to do? 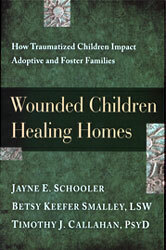 These questions can trouble the minds of adoptive parents caring for wounded, traumatized children. Families often enter into adoption experience with high expectations for themselves and their children but are quick to discover that these hopes are not realistic. This book addresses those unmet expectations and offers validation and solutions for the challenges that arise when parenting deep;y tramatized or emotionally distrubed children.